A card of messages and love. Also can represent a shy person. Truthful expression of feelings, and even creativity. It also means the arrival or approach of someone, a lover. Cups are connected to water, and emotions and art. This is a card that lets you know everything is about to go perfectly. So, it's been turning up in my readings constantly the last few weeks. Almost teasing me with the promise of better things ahead. 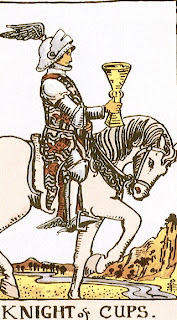 But no matter what, this Knight of Cups is all good baby.